Shihsanhang’s anthropomorphic pottery is poised to host a gathering of friendly faces. Be it a shy, humble countenance, an honest or smiling visage, or something made of ceramics or wood, faces of various types are coming together to tell their stories. 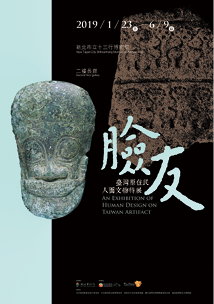 Facial masks and figureheads of various types and styles occupy an important place in the Taiwanese archeological discoveries, and of the history and cultural meaning of Taiwanese indigenous societies. We are inviting you to check out the Shihsanhang Museum and meet face-to-face with the faces. CAR→No. 15 Provincial Highway: Guandu Bridge No. 15 Provincial Hwy proceed towards Bali(Longmi Road)→Zhonghua Road→Wenchang Road→Museum Rd.→Shihsanhang Museum of Archaeology. MRT→Tamsui MRT Station→Ferry→Shuttle Bus Red No. 13 Shihsanhang Museum of Archaeology; or Ferry→Shuttle Bus Red No. 22, Bus No. 704→Ren'ai Rd→Walk 5 minutes→Shihsanhang Museum of Archaeology.